Love Makes a Family is a favorite Laughing Pizza song in our household. The fun group caught our 3 year old, Shaunsito’s, attention last year and we even had the chance to meet them. They were the sweetest family ever! I feel good about my son rocking out to their music and watching them on television – they are so energetic & fun. That’s why we were so excited to find out they were coming to Atlanta for a one time only VIP Family Film Premiere with a Red Carpet Event at the Georgia Aquarium! Beginning at 11:00 a.m., guests will get the “red carpet treatment” with photographs, spectacular views into the world’s largest aquatic habitat, Ocean Voyager, as well as views into the charismatic beluga whale habitat from within the grand Oceans Ballroom. There will also be entertainment by Atlanta’s own Circus Camp and more. The VIP screening of Laughing Pizza: The Concert Movie, will begin at 12:00 p.m. (The film has already won 5 out of 5 Doves from the Dove Foundation, and was endorsed by the Parents Television Council.) After the screening, Laughing Pizza will perform a few of their hits, and guests will have the opportunity to meet Billy, Lisa and Emily, up close and in person! Laughing Pizza is a real family band that writes and performs all original pop-music for families. Their music videos can be seen every day in more than 18 million homes on PBS stations and TV On-Demand channels around the country. This mom, dad and daughter trio travel across the nation performing at theatres, museums, music festivals, nightclubs, schools, and other venues – including the White House (with Miley Cyrus and The Jonas Brothers). Their live performances are energetic, interactive, dance-filled shows that get kids and parents up and moving, and they have a loyal following all across the country. There are two ticket options for families to purchase: VIP Red Carpet Premiere tickets include admission to the film, live performance by Laughing Pizza, meet and greet with the band, and red carpet festivities. VIP Red Carpet Premiere tickets are $15 (Children under 1 years old are free). For an even more spectacular experience, guests can upgrade their tickets to the VIP Red Carpet Premiere Plus ticket, which includes admission to the premiere and its events, as well as admission to the Aquarium and the 3:30 p.m. showing of AT&T Dolphin Tales. VIP Red Carpet Premiere Plus tickets are $34.95 for adults and $28.95 for children. Children ages 1-3 years old need only a film pass, as they are admitted to the Aquarium for free. For more information and to purchase tickets, CLICK HERE. The event is sponsored by Shumate and B-98.5FM. A portion of all proceeds will go to The Georgia Aquarium’s SEA Program. 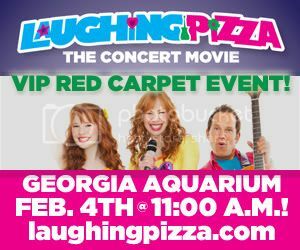 Want to win a Family 4-Pack of Tickets to the Laughing Pizza VIP Red Carpet Movie Premiere? Of course you do! Your chance to win below. I love that Laughing Pizza is a GA based, therefore local band. I love that they are a family. I love their fun, clean, kids songs. I love their energy and personality. I’d really love to go. We love Laughing Pizza and the aquarium!